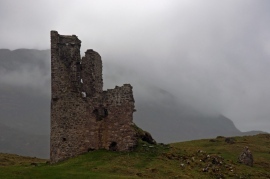 "Ardvreck Castle, Loch Assynt, Sutherland, Scotland, 13 April 2011 - Flickr - PhillipC" by Phillip Capper from Wellington, New Zealand - Ardvreck Castle, Loch Assynt, Sutherland, Scotland, 13 April 2011. "CapeWrathFromSeawardByColinWheatleyFeb2007" by Colin Wheatley - From geograph.org.uk. 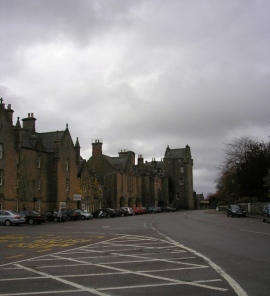 "Dornoch (11470602744)" by Mark Harkin - Dornoch. "Sandwoodbay" by Norbert Büchen - Own work. "Suilven2" by Moyearo - Own work. 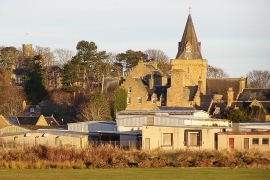 "The Royal Burgh of Dornoch - geograph.org.uk - 1561387" by Iain Lees - From geograph.org.uk. 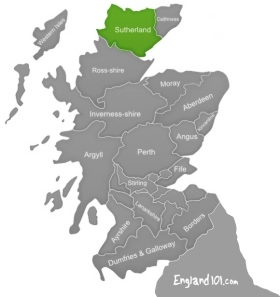 Sutherland is found at the tip of Scotland in the Highlands. It borders Caithness, Ross-shire and Cromartyshire, as well as the Atlantic Ocean on both the north and west. Gold was first found in Scotland back in 1239, and since then it has been regularly mined. Throughout the 16th century, gold was found in abundance. 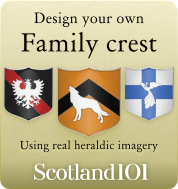 It was used to make the crowns of James V and his second wife, Mary de Guise, as well as in many royal gifts, and in the gold coins use throughout his reign and Mary Queen of Scots. Robert Gilchrist discovered gold in Kildonan, Sutherland in 1868, which triggered the Helmsdale gold rush. Today it is possible for anyone to experience the excitement that the panners of the gold rush experienced; visitors can hire equipment from The Strath Ullie Craft and Gift Shop and head down to the river to test their luck. 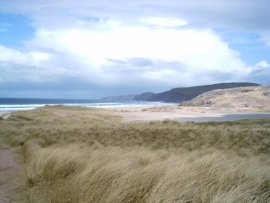 The most north-westerly point of Sutherland is Cape Wrath. 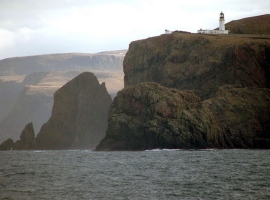 A trip here usually involves a little ferry crossing to the Cape Wrath peninsula with the drivers indulging you all in his various tales, before heading up to the lighthouse to explore the area. Up here you might spot seals or deer as you take in the spectacular views of one of the country’s most remote spots. The village of Scourie is in ‘Mackay Country’ – the area of Scotland that was formerly dominated by the Clan Mackay. They built a fortified house here in the late 16th century, which the Duke of Sutherland transformed into a coaching inn in 1840, before it was renovated into a hotel. It is a great base for exploring the region because of its excellent road connections. The scenery is dominated by the Foinaven, Arkle and Quinaq mountains and the sandy coastline. Altnaharra is a fisherman’s paradise, with trout and salmon in abundance. The area is also brimming with history, ancient hut circles, brochs and remains of crofters shelters. The roads in this area were originally used to drive livestock to market, and along the road where the Altnaharra Hotel now stands, used to be a 17th century Drover’s Inn. The area became popular for shooting and fishing in the 1820s, and remained as such ever since. The landscape around Altnaharra includes Loch Naver and Loch Hope, which are are some of the best trout and salmon fishing spots in the whole of Scotland. The surrounding estates are good for deer and game shooting.